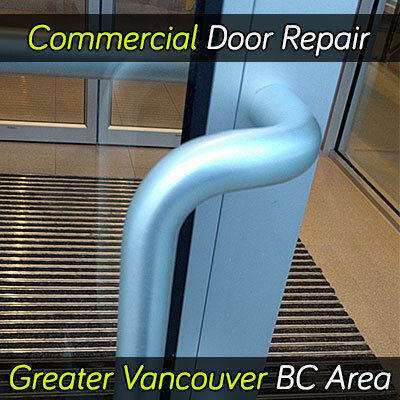 When you need a service for the commercial door in the greater Vancouver BC zone, we are the answer to your needs. Our team of professionals can bring to you the reassurance that you have all covered. Our technicians are certified in proper installations. You can be sure we will solve any problem with doors for commercial use. Commercial doors are used extensively. Therefore, they need the most services. One of the most common services in the door business is commercial door repair. Many people use commercial doors throughout the day. That makes all movable parts more suitable for damage due to extensive use. They are also exposed to more risks than residential doors. For example, a commercial facility is more likely to be vandalized or violated, making commercial doors more vulnerable. Depending on the zone they are used, commercial doors can be at risk of accidental hits constantly. That is why commercial door repair is one of the most common services around. Public facilities also need to have an extensive maintenance due to safety regulations. Most doors are emergency exists, and that means that they should work properly. There is no room for mistakes because they can cause lives in case of a disturb. The most frequent service is the commercial entry door repair. Especially entry doors that remain closed and are opened with each new visitor need constant repair. They are accidentally damaged by users and also torn off with use. To get a commercial door installation service is the beginning of a long lasting installation. When you look for your door to last longer, it is best to make use of skilled professionals to do the job. Special doors for emergency exits and fire proof are of particular importance. They must comply with regulations, and it is not just about the manufacturing. The installation should also be done to comply with regulations. Commercial locksmith poses vital importance. They are meant to secure valuables, and the installation is also important to get the best results. Ask us, and we will guide you through the selection process until the final installation. Automatic doors for commercial use are becoming more popular every day. Either opened with a control access system or a sensor, they have become a standard for public and private facilities. The attractiveness of automatic doors at most places is that they help to keep air conditioning systems always efficient. It is a way to save power consumption since the door is not a potential leak because people, in general, do not close them. However, the benefits come with the need of specialization. Automatic doors for commercial use require technicians who know about their installation, repair, and maintenance. They need double the support than a regular door does. We know how to repair your automatic doors for commercial use. Our specialists can recommend you a maintenance policy to cover your door’s particular case. We consider the usage of your door, plus the availability you need for it. Commercial doors are used extensively. The importance of a fast work is vital to keep with operations. On public places, the doors are an important point to keep people safe. For private installations, they doors are meant to protect valuables, the installation, and information. To have access to a 24 hour service is important. That way you can attend any emergency on commercial doors. 24hr Door Repair has guards to serve you 24/7, and our commercial clients can feel confident that we have their back. The service is meant to take care of emergencies so that there are no casualties to regret. We know how your doors are important to you, and we treat them to wipe all your concerns.